Opinion : Can Competency Based Education Be Stopped? Over at StopCommonCoreNYS, you can find the most up-to-date cataloging of the analysis of, reaction to, and outcry over Competency Based Education. Critics are correct in saying that CBE has been coming down the pike for a while. Pearson released an 88-page opus about the Assessment Renaissance almost a year ago (you can read much about it starting here). Critics noted way back in March of 2014 (okay, I'm the one who noted it) that Common Core standards could be better understood as data tags. And Knewton, Pearson's data-collecting wing, was explaining how it would all work back in 2012. Every single thing a student does would be recorded, cataloged, tagged, bagged, and tossed into the bowels of the data mine, where computers will crunch data and spit out a "personalized" version of their pre-built educational program. Right now seems like the opportune moment for selling this program, because it can be marketed as as an alternative to the Big Standardized Tests which have been crushed near to death under the wheel of public opinion. "We'll stop giving your children these stupid tests," the reformsters declare. "Just let us monitor every single thing they do every day of the year." It's not that I don't think CBE is a terrible idea-- I do. And it's not that I don't have a healthy respect for and fear of this next wave of reformy nonsense. But I can't shake the feeling that while reformsters think they have come up with the next generation iPhone, they're actually trying to sell us a quadrophonic laser disc player. Teaching machines first cropped up in the twenties, running multiple choice questions and BF Skinner-flavored drill. Ever since, the teaching machine concept has kept popping up with regularity, using whatever technology was at hand to enact the notion that students can be programmed to be educated just like a rat can be programmed to run a maze. Remember when teaching machines caught on and swept the nation because they provided educational results that parents and students loved? Yeah, neither does anybody else, because it never happened. The teaching machine concept has been tried, each time accompanied with a chorus of technocrats saying, "Well, the last time we couldn't collect and act on enough data, but now we've solved that problem." Well, that was never the problem. The problem is that students aren't lab rats and education isn't about learning to run a maze. The most recent iteration of this sad, cramped view of humans and education was the Rocketship Academy chain, a school system built on strapping students to screens that would collect data and deliver personalized learning. They were going to change the whole educational world. And then they didn't. Point is, we've been trying variations on this scheme for almost 100 years, and it has never caught on. It has never won broad support. It has never been a hit. Remember how inBloom had to throw up its hands in defeat because the parents of New York State would not stand for the extensive, unsecured and uncontrolled data mining of their children. inBloom tried to swear that the kind of data mining and privacy violation and unmonitored data sharing that parents feared just wouldn't happen on their watch. But the CBE sales pitch doesn't just refuse to protect students against extensively collected and widely shared data mining-- CBE claims the data grubbing is not only not a danger, but is actually a valued feature of the program. The people who thought inBloom was a violation of privacy and the people that thought Common Core was a gross federal overreach-- those people haven't suddenly disappeared. Not only that, but when those earlier assaults on education happened people were uneducated and unorganized-- they didn't yet fully grasp what was actually happening and they didn't have any organizations or other aggrieved folks to reach out to. Now all the networks and homework are already done and in place. I don't envision folks watching CBE's big data-grabbing minions coming to town and greeting them as liberators. CBE is more of what many many many people already oppose. This has always been a problem for reformsters. "Give me that straw," they say, "and I will spin it into gold." They've had a chance to prove themselves with every combination of programs they could ask for, and they have no successes to point to. Remember all those cool things Common Core would accomplish? Or the magic of national standardized testing? The only people who have made a respectable job of touting success are the charteristas-- and that's not because they've actually been successful, but because they've mustered enough anecdotes and data points to cobble together effective marketing. It's lies, but it's effective. Everything else? Bupkus. This will be no different. CBE will be piloted somewhere, and it will fail. It will fail because its foundation combines ignorance of what education is, how education works, and how human beings work. A CBE system needs to be linked to some sort of national standards, but only those who have been very well paid have a deep commitment to them are still even speaking the name of Common Core. To bag and tag a nation's worth of data, you must have common tags. But we've already allowed states to drift off into their own definitions of success, their own tests, their own benchmarks. Saying, "Hey, let's all get on the same page" is not quite as compelling as it once was, because we've tried it and it sucked. As the probably successor to ESEA says, centralized standardization of education is not a winning stance these days. So to what will the CBE be anchored? Remember how expensive it was to buy all new books and get enough computers so that every kid could take a BS Test? You can bet that taxpayers do. Those would be the same taxpayers who saw programs and teachers cut from their schools even as there was money, somehow, for expensive but unnecessary new texts and computers (which in some cases could be used only for testing). When policy makers announce, "Yeah, here's all the stuff you need to buy in order to get with the CBE program," taxpayers are going to have words to say, and they won't be happy, sweet words. If every single worksheet, test, daily assessment, check for understanding, etc is going to go through the computer, that means tons of data entry OR tons of materials on the computers, through the network, etc etc etc. The kind of IT system required by a CBE system would be daunting to many network IT guys in the private sector (all of whom are getting paid way more than a school district's IT department). It will be time-consuming, buggy, and consequently costly. Who wants to be the superintendent who has to say, "We're cutting more music and language programs because we need the money to make sure that every piece of work your child does is recorded in a central data base." Not I. For the first time, the general taxpaying public may really get what teachers are feeling when they roll their eyes and say, "A NEW program? Even though we haven't really finished setting up the old one?!" I think that CBE is bad education and it needs to be opposed at every turn. But I also think that reformsters are severely miscalculating just how hard a sell it's going to be. We can help make it difficult by educating the public. But there will be huge challenges for the folks who want to sell us this Grade C War Surplus Baloney. It's more of a product that nobody wanted in the first place. We just have to keep reminding them why they didn't like it. 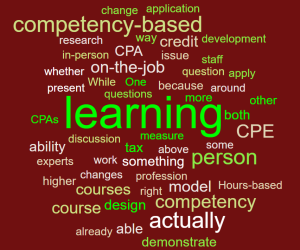 0 Response to "Opinion : Can Competency Based Education Be Stopped? "